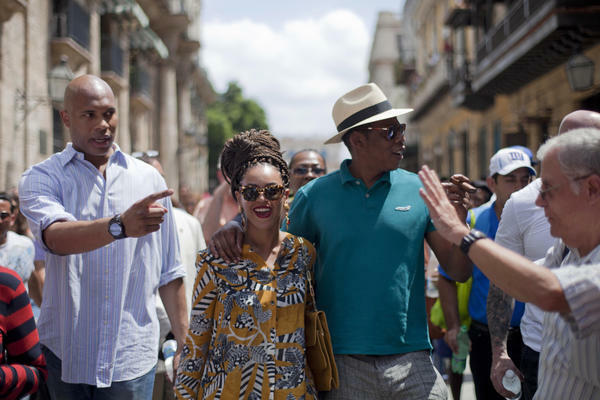 U.S. singer Beyonce and her husband, rapper Jay-Z, right, tours Old Havana as a body guard, left, and tour guide, right, accompany them in Cuba on Thursday, April 4. This week, Washington took on hip-hop royalty, when two Florida representatives went after Jay-Z and Beyonce for their recent trip to Cuba. "We're saying that no one is above the law, even if you are the diva Beyoncé, and that's wonderful that she's famous and rich, and Jay-Z, everybody loves him, too. Terrific. But no one's above the law," Rep. Ileana Ros-Lehtinen told CNN. As we reported, it was much ado about nothing, because the U.S. Treasury said the couple's trip was legal. They traveled with a group authorized by the U.S. government to conduct programs that "promote people-to-people contact" on the island. "Politician never did [anything] for me / Except lie to me distort history. / Wanna give me jail time and a fine? / Fine, let me commit a real crime. / I might buy a kilo for Chief Keef / out of spite, I just might flood these streets," he raps. Then the chorus kicks in: "Ya'll gonna learn today," it repeats. And Jay-Z raps: "You almost wanna start a revolution. / You know whenever I'm threatened I start shooting." During the White House briefing this afternoon, White House Press Secretary Jay Carney was asked about the song, specifically a line in which Jay-Z says a "boy from the hood (has) White House clearance." Carney made light of it. MTV reports the song was recorded Wednesday night and published on Jay-Z's website Thursday morning.